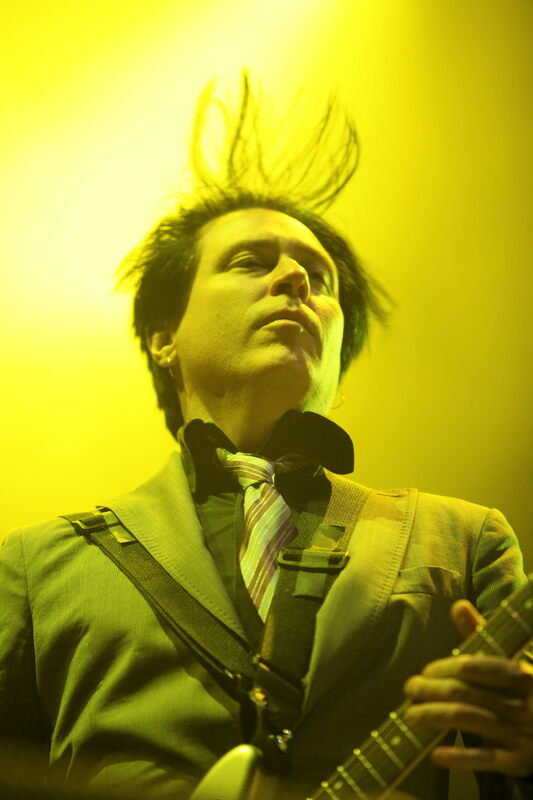 STONE AGE ROMEO: Queens of the Stone Age guitarist Troy Van Leeuwen. Rock juggernaut Queens of the Stone Age are visiting the Hunter for the first time in March. They are on their global tour for sixth studio record …Like Clockwork. The world-renowned live band are joined by influential industrial rockers Nine Inch Nails, with the bands flipping a coin each night to see who plays first. Nick Milligan speaks with Queens of the Stone Age guitarist Troy Van Leeuwen about the recording process and how a health scare for singer Josh Homme informed the dark atmosphere of their latest epic. What impact has the material from …Like Clockwork had on Queens of the Stone Age’s live show? Our show is based around the new record […Like Clockwork]. Last time we were on tour in Australia and New Zealand our show was based around the re-release of the first record. There was a nostalgic feel to that. It was really stripped down and the show was simple. But this record is not that. We figured this time around we were really going to base everything on the present and what’s coming in the future, which for us is more in-depth. It’s more colourful. We’ll play stuff from our other records too, but we play every song on the new record. In choosing what songs from the other records make it on to the setlist, do you look for tracks that fit comfortably with the sound of the new material? Well there’s songs that are standards, like the radio singles. No One Knows, of course, we play. And Go With The Flow we play every night. But we’re also allowing ourselves to expand on other jams. Sometimes we play Better Living Through Chemistry off Rated R, which has a middle section where we do some improv. We’ll sprinkle in things that are atmospheric and allow us to spread our wings. On your upcoming tour of Australia with Nine Inch Nails, the two bands will be flipping a coin to see who plays first. Nine Inch Nails definitely won’t be an easy act to follow. We’ve opened up for them many times and they always put on a great show. There’s no doubt about it. It’s going to be a good competition between us, I think. We’re going to push each other a little bit. I know they’re going to push us, for sure. … Like Clockwork was the first album in which bassist Michael Shuman and keyboardist Dean Fertita were present for the recording. Did they have a big impact on the album? Every record is different. The short answer is yes, of course they impacted the record. The bass playing Michael has added is stellar. People are going to start seeing what a real talent Mike is. He’s not just a bass player but a great singer and player of all instruments. Dean is a piece of the puzzle that is a rock – he’s always dependable and able to deliver off the cuff. There’s a great set of players in the band now. Jon [Theodore, drums] played on the record a little bit too and his stamp is on there. It’s a Queens record, and each of them are different. Most of the new direction, as far as the songwriting, was a conscious decision by all of us. It was a conscious decision to have the vocals very upfront. The past records have pushed the music, but this time we’ve tried to open it up and sonically let everything be heard in a natural way. There was a long list of guest musicians on …Like Clockwork, like Elton John, Alex Turner, Dave Grohl and Trent Reznor, but there are contributions are more textural rather than obvious appearances. Was that a conscious decision by you guys? Usually we don’t incorporate any philosophy other than, ‘Hey, c’mon over and jump in our realm for a minute.’ You’re encouraged to do something that you normally wouldn’t, but at the end of the day you’ll have to be yourself. That’s the parameters. Everybody delivers something really amazing. The person I keep thinking about is Jake Shears [of Scissor Sisters], who sings on Keep Your Eyes Peeled. It does not sound like the Scissor Sisters and he delivers something so amazing and dramatic. If you didn’t tell them it was Jake Shears, they wouldn’t know. I liked working with him, it was really impressive. Does it take a high level of musical proficiency to be a part of Queens of the Stone Age? It does. We have no slouches in the band. Everybody has to have the ability to do anything and everything. You have to be flexible and ready, and have your mind sharp. Josh had a very severe health scare before the writing of …Like Clockwork. I read that yourself, Dean and Michael tried to left his spirits and convince him to make another record. Was there any point in which you thought there might not be another Queens of the Stone Age album? I would say it’s not a matter of convincing, but more a push to be afraid and express being vulnerable. You can’t express things that you’re not feeling. If you’re feeling vulnerable, you’d be lying if you didn’t say it. You might as well talk about what you’re going through – the truth. We’ve always been this band that has a tongue-in-cheek philosophy about everything, but this was very serious. All of a sudden Queens of the Stone Age was very serious, and that was a challenge. But at the end of the day we’re really happy with what we came out with, because we were totally uncertain that we were going to get through it. But the convincing wasn’t really to make another record, but to express yourself – which leads to making art. There are large, theatrical pieces of music on …Like Clockwork. Is that aspect of the record one of the ways in which the idea of vulnerability manifested itself in the songwriting? It definitely did, and also the title of the record. It’s probably the only ironic thing about it, because it did not go “like clockwork” at all. I think there was maybe two songs that didn’t give us problems. The rest were laboured over and fought over, and ideas changed in the middle of them. The song does what it wants to do. If it doesn’t want to have drums in the verse and it wants to have a drum machine, then that’s what it wants. There’s stuff like that. We allowed ourselves to take as long as it took and we didn’t spare a second. We listened to the masters on the plane on the way to our first show, in South America, and devised an email saying, ‘Ok, it’s done.’ By the time we landed the email went out, and that was it. We literally worked on it every second until we were playing again. Is it true that there is enough leftover music from the …Like Clockwork sessions to put out another record soon? Well, we did a lot of music. We recorded a lot. We decided to make the record really tight, we didn’t want to load it up with anything superfluous. But there’s music that we haven’t finished yet, yeah. There’s a lot. When we’re going to get to it I don’t know because our schedule is pretty full up with touring and sometimes it’s better to focus on the present instead of getting the next record done. The Newcastle performance on Saturday, March 8 will be the exact 20-year anniversary of the release of Nine Inch Nails’ landmark record The Downward Spiral. Have you heard any rumours about whether the band are planning something special for that night? I haven’t heard anything, but I don’t see why there shouldn’t be something special. It’s an amazing record. But I don’t know anything. I know that Trent, from our experiences of touring with him, changes up the sets. You never know. Do you have anything else planned with your other musical projects in 2014? I just shot a video for the new Sweethead [Leeuwen’s other band] single and we might make an appearance in your neck of the woods soon, this year. We’re always making music, there’s always stuff happening.